The Alps are Hanwag’s local mountains. Virtually all of us spend our summers exploring them. People are going on longer trips in the mountains, for more than just a weekend. Multi-day tours and hiking across the Alps are growing in popularity. 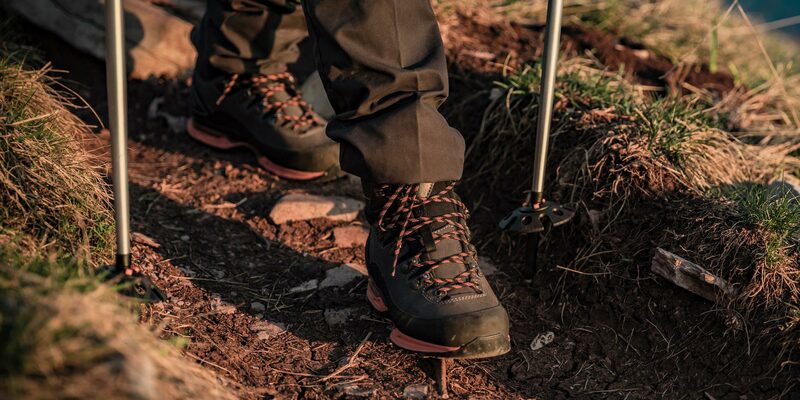 People increasingly want a mountain boot that offers the required stability for trekking with a heavy pack, but that is as flexible and as light as possible and that they can also use on more rocky, alpine terrain. Weighing 1,460 g/pair (Men, UK 8), it is 15 % lighter than its predecessor and offers a unique mix of traditional functionality, such as the full leather upper made of thick, high-quality Perwanger split leather, tried-and-tested Hanwag fit and modern elements, such as innovative LFX upper technology and a lightweight Integral Light sole construction. Due to its design, the upper moves with greater (lateral) flex to the side together with the lower leg axis. On the ALVERSTONE II, we use a particularly abrasion-resistant fabric woven from polyamide and polyurethane yarns to ensure the upper stability. And at the flex zones, we use a more flexible woven polyamide fabric. A TPU frame between the heel and midfoot ensures torsional stability, while at the heel the frame is lower, allowing us to use softer PU, which provides better cushioning and reliable stability. In the outsole, 3D PrismBase technology makes it possible to save weight. In addition, the ALVERSTONE II has a climbing zone at the front of the sole.